Reminder: Cold Cave Free LA Show at Space 15Twenty! As previously posted Cold Cave will be performing a free show at the Urban Outfitters’ affiliated Space 15Twenty space TONIGHT! Wristbands for entry are available at Fingerprints, Origami, Vacation Vinyl and Rhino Records (while supplies last!). And keep your eyes glued to the Matador Facebook & Twitter for additional chances to win entry. And an update since yesterday’s post; you can now also win a chance at tickets to Space 15Twenty by tuning in to KXLU (88.9FM Los Angeles). KXLU will be giving away tickets on the air until Noon PST today. Don’t miss out! And don’t forget, Cold Cave will also be playing The Music Box this Friday (SOLD OUT) with tour-mates, The Kills. 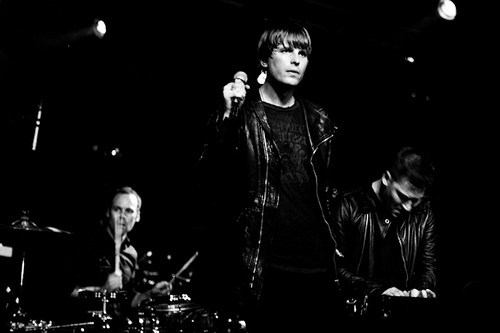 And if that’s not enough Cold Cave will also be performing live on KCRW’s “Morning Becomes Eclectic” this Friday morning (live at 11:15AM PST, 2:15PM EST). Details here.